One Ban owing , but it's past due , so now its doubled? H. E. L. L. Returns back with a smirk..
You can wipe that smirk off! Banned.for missing the golden rule! Banned , for somehow reminding me of vodka and fast-food hamburgers . Banned for forgetting vodka and fast food, consult your food pyramid, vodka and fast food are apart of your 5 a day. For 18 days I've searched for this 'pyramid' which I'm now quite convinced DOES NOT exist . Banned for leading me on a Wild Goose chase , which coincidentally IS on some 'pyramids' . 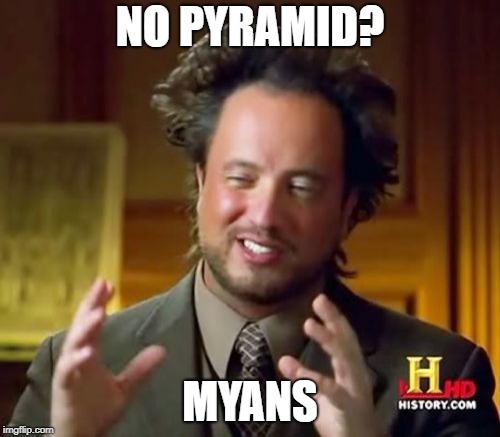 You know why there is no pyramids? But you're wrong, I haven't banned you, I just looked. Banned for banning the dude that never banned me. Banned! Banned for not being banned by pretty much every mod on this forum. Banned for getting a notification of this quote. Banned for getting a notification of this this and that that quote, unquote. Mr Creosote says I should Ban you for not offering me even a tiny little after-dinner mint along with your ban . I've had a food amnesty on this occasion so I'm actually unbanning the person above, yes you fella. I'm not only going to give you an after dinner mint but I'm going to provide you with the dinner for the after dinner mint, desert and coffee as well.